The Serval is a medium-sized cat, which stands out for its long legs and its short tail. The long legs come in handy when he hunts mice in the high grass. When he hears, thanks to his good ears, a prey in the grass, he jumps flawlessly on top of it. He can even catch birds from the air with such a jump. Servals are among the small felines. The length of the body is about 70 to 100 cm. Males are larger and heavier than females. Servals are slender animals with a long neck and long legs, so they can look above high grass. Their coat is orange-brown in color with black spots and stripes. They have a white belly. The tail is short compared to the rest of the body and has a black tip. They have the biggest ears of all felines. The large, round flap ears almost touch each other. Servals can hear and see very well. They can not smell well. That means that they eat meat. They mainly eat rodents and other small animals such as birds, lizards, fish and insects. They hunt the most in an area with a lot of high grass and scrub. This is where their sharp hearing comes in handy. 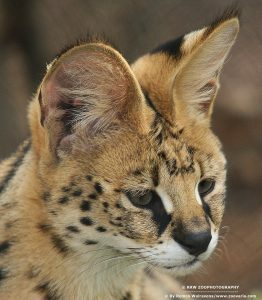 Servals can hear very soft sounds through their large ears. 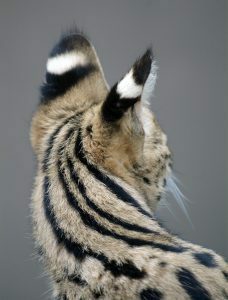 When it is dark, servals even go to their ears alone. They are very successful in hunting. Of the ten hunting attempts, four succeed during the day and six at night. Servals can hear where a bird or other animal runs over the ground. They sneak up to the sound and surprise the prey with a quick jump. With a few blows the prey is beaten out of the way and bitten to death. With their long, mobile front legs, servals can get rodents out of their caves. When servals hear that a rodent is walking in an underground corridor, they know exactly where to go ‘angling’. Servals are good swimmers. They wade quietly through the water on the hunt for frogs and fish. When the serval hears a bird low through the air or sees flies, it jumps up. This jump is called a ‘mouse jump’. All legs are released from the ground at the same time and the bird is fished from the air with the front legs. The small cats can jump about two meters high and four meters away. like almost all felines. Solitary means that the animals do not live in groups, but only. They each have their own territory. That is a residential area. Other species are chased away in this territory. Females may enter the territory of males. When a man comes into the territory of another man, he is chased away. Servals indicate the boundaries of their territory by spraying with urine. They also rub their chin and cheeks against objects, drooling. In the feet of Servals are sweat glands that release a distinct smell. This scraps them over the trunk of a tree. Other servals therefore smell that the area is of another. Male and female Servals only form to pair. They rest and hunt together for a number of days. Then they each go their own way again. Servals communicate by growling, mumbling, crying sounds and grunting. To make something clear to each other, they use not only sounds but also body language. By making themselves big, showing their teeth and threatening to hit their paw, they say, for example: “Beware! After a gestation period of about 75 days two to three young Servals are born. The nest where the kitten comes into the world is well hidden. It is often located in an abandoned den of another animal, or between rocks or dense thickets. The kittens are born naked and with closed eyes. The mother is only there for the raising of her boy. She is busy all day with the care and food. The first three weeks the kittens only drink milk from their mothers, after which they occasionally eat meat. The young servals stay in the nest for four to five weeks. Here they are well protected. After five weeks the kittens comes out step by step. They then go with their mother who teaches them to hunt. She does not kill the prey she catches, but she gives them to her kittens to practice with. The young are independent when they are about nine to twelve months old. Then a mother chases the young men first. The young females may stay a little longer. If they can get young themselves, the mother also chases away her daughters. Farmers also kill Servals. They are afraid that the Servals will eat their cattle. In areas where many people live, almost no Servals occur anymore. In other areas, the number of Servals is happily increasing again. The natural enemies of the Serval are; Hyenas, African wild dogs and leopards. Because Servals are so small they are sometimes seen as prey animals. 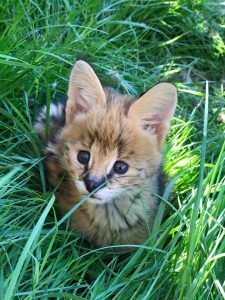 Especially young Servals are very vulnerable and are sometimes eaten by these animals. As soon as a Serval feels threatened, they climb quickly in trees and on rocks, so they can climb very well. In 2010 we, Mark and Heika, got our first Savannah cat and we fell in love with this breed. After we moved to the beautiful free nature reserve Oldambt near Winschoten, the choice was made quickly. We started our cattery in 2012 and we can now proudly say that we are the top in the Netherlands and among the top in Europe. Appearance, character, health and breed characteristics are very important to us and that is how we distinguish ourselves from others. Clic: Here for more information.